Although we are currently bombarded with numerous health scares--AIDS, West Nile virus, avian flu, and the recent swine flu, just to name a few that now fill our media reports and instill dread in the population--we can scarcely imagine the outlook that dominated the mindset of those who endured the bubonic plague in England during the sixteenth and seventeenth centuries. 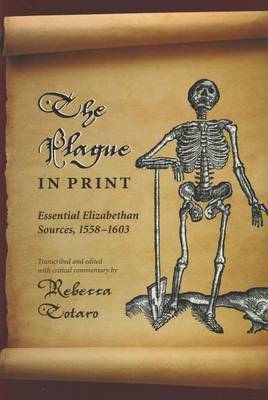 Between the time of the Black Death and the Great Plague, this horrifying bubonic plague struck the country at such regular intervals that it shaped the general consciousness and even produced a popular genre of plague writing.In The Plague in Print, Rebecca Totaro takes the reader into the world of plague-riddled Elizabethan England, documenting the development of distinct subgenres related to the plague and providing unprecedented access to important original sources of early modern plague writing. Totaro elucidates the interdisciplinary nature of plague writing, which raises religious, medical, civic, social, and individual concerns in early modern England. Each of the primary texts in the collection offers a glimpse into a particular subgenre of plague writing, beginning with Thomas Moulton's plague remedy and prayers published by the Church of England and devoted to the issue of the plague. William Bullein's A Dialogue, both pleasant and pietyful, a work that both addresses concerns related to the plague and offers humorous literary entertainment, exemplifies the multilayered nature of plague literature. The plague orders of Queen Elizabeth I highlight the community-wide attempts to combat the plague and deal with its manifold dilemmas. And after a plague bill from the Corporation of London, the collection ends with Thomas Dekker's The Wonderful Year, which illustrates plague literature as it was fully formed, combining attitudes toward the plague from both the Eizabethan and Stuart periods. These writings offer a vivid picture of important themes particular to plague literature in England, providing valuable insight into the beliefs and fears of those who suffered through bubonic plague but also illuminating the cultural significance of references to the plague in the more familiar early modern literature by Spenser, Donne, Milton, Shakespeare, and others. 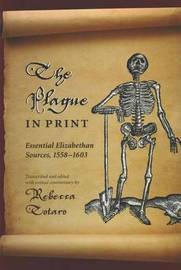 As a result, The Plague in Print will be of interest to students and scholars in a number of fields, including sixteenth and seventeenth century English literature, cultural studies, medical humanities, and the history of medicine. Rebecca Totaro is assistant professor of English at Florida Gulf Coast University where she serves as program coordinator of English and as assistant chair of the Division of Humanities and Arts. Her work has appeared in Reading the Sea: New Essays on Sea Literature and Utopian and Dystopian Writing for Children and Young Adults.